Do you not know that I have power to release you, and power to crucify you? 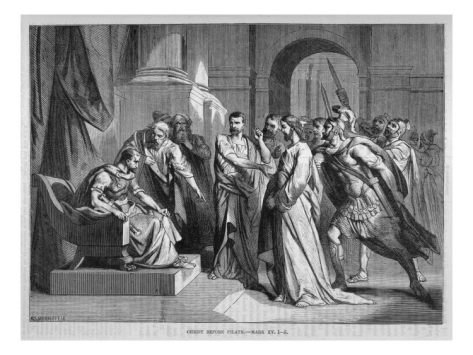 In his account of the dialogue between our Lord and his judge St John the Theologian puts a number of questions into the mouth of Pilate. The Roman Governor is, in fact, one of the very few gentiles with an extended role in the Gospel accounts. 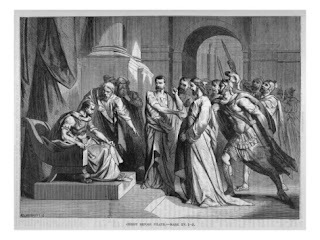 Here, perhaps, St John conscious that most of his audience were also gentiles makes Pilate their representative. The questions he asks are important not simply in the context of the Passion but also they are important for us. They go the the heart of who Jesus is and why He matters to the world. Does this matter to non-Jews? Very much so. If there is but one God, Father, Creator and sustainer of all that is, then His interventions into human history have a purpose which we would do well to heed. In a sense we are all Jews now. The Messiah has opened the doors into the people of God to all who are the children of Abraham, Isaac and Jacob by faith and not simply by blood. Or, more precisely, we are children through the blood of Christ rather than the blood of Abraham. And being made members of God's household we obtain new privileges and duties. The key difference was that the Apostles saw the power of God acting through our Lord guaranteeing the success of His mission. albeit in ways they did not foresee. The Jerusalem authorities saw the power but doubted the source. For them He was only a man and Rome was greater than Him. In Him the Apostles hoped and because of Him the Sanhedrin feared. 27 but thou art the same, and thy years have no end. The interesting thing about the question "What is truth?" is that having asked it Pilate left without waiting for an answer. In that, surely, he is a representative figure for all of us. He knew that this was perhaps the most important question of all. He knew also that he was in the presence of one who could answer that question. Yet the pressures of the world and its demands upon him took priority. He left Jesus in order to stop being ignorant in the presence of knowledge and start being powerful in the presence of those subject to him. God reveals Himself to those who listen. Some listen not at all, some but seldom and very few listen with all their being all the time. In this Pilate reveals what we are and the Blessed Virgin Mary shows what we should be. Where have you come from? An important question for Jew and gentile alike. Yet we know where this man comes from; and when the Christ appears, no one will know where he comes from. You know me, and you know where I come from? But I have not come of my own accord; he who sent me is true, and him you do not know.29 I know him, for I come from him, and he sent me. The seventh question is clear. Man tells God that we have power over Him. The same assumption made in Eden is now made in the Praetorium and, perhaps, within your heart and mine. We can take up and put down Jesus as and when we want in the measure that we want. The power is ours.Yet Pilate was mistaken, the High Priest was mistaken. And you? Are you in error too? With gold skeletal tree branch. Rocks. Spring stream runs home. With blossom quiver, soft breeze. Spring frost slays new buds. Hidden seeds, untouched, grow on.